Putin speaks before the State Duma where he made the annexing of Crimea official. Russia has officially annexed Crimea, and Ukrainian forces stationed in military bases on the peninsula have until Friday to evacuate to mainland Ukraine. I condemn President Putin’s announcement of new laws incorporating Crimea into the Russian Federation. Russia has disregarded all calls to step back into line with international law and continues down the dangerous path. Russia continues to violate Ukraine’s sovereignty and territorial integrity, and remains in blatant breach of its international commitments. There can be no justification to continue on this course of action that can only deepen Russia’s international isolation. Crimea’s annexation is illegal and illegitimate and NATO Allies will not recognise it. I am deeply concerned by reports of the death of one Ukrainian officer. It is urgent that all sides show restraint and take all possible steps to avoid further escalation. 2040 GMT: As we’ve been reporting, a Ukrainian military base was stormed and a soldier was killed in Simferopol. AFP has more details on Crimea’s claims that the second person killed, allegedly a member of the Crimean self-defense forces, was killed by someone outside of the nearby military base. A spokeswoman for Crimea’s pro-Kremlin police department later reported that a member of the peninsula’s “self-defence” force had also been killed in the same incident. But she blamed both the death of the pro-Russian militia member and the Ukrainian soldier on shooting by unidentified assailants from a nearby location. “They were shooting from the same location at both the self-defence forces and at the Ukrainian servicemen,” Crimean police force spokeswoman Olga Kondrashova told the Interfax news agency. Defence ministry spokesman Seleznyov said pro-Russian forces had by late Tuesday taken complete control of Ukraine’s Simferopol base. “The centre has been taken under their full control. All the servicemen inside were lined up in a row and their documents seized,” he said. Video of the burial today of Crimean Tatar Reshat Ametov, a 39-year-old father of three who was found dead nearly two weeks after going missing following his participation in a March 3 protest against the presence of Russian troops in Crimea. The Kryminform news agency, citing an unnamed local police source, reports shooting came from a house under construction opposite the center and targeted Crimean self-defense units as well the military center itself. “Earlier today self-defense units were informed that a group of armed men had been discovered in a partially inhabited building,” a source from the ministry said. “As they were taking measures to check, self-defense units came under fire. One man was killed, one wounded,” the source explained, adding that shooting came “in two directions from one spot”. The Kryminform source claimed another man from the military center was wounded. RT’s producer contacted staff inside the military center, who confirmed that the shooting did take place and came from a nearby house under construction. At the same time, the man had no information on the casualties. Meanwhile, multiple reports that a Ukrainian serviceman died in the incident are unconfirmed by our crew at the scene. We should note that other reporters who were relatively close to the base are maintaining that they heard gunfire from inside the base, not from some house outside, and as we posted earlier, blood was found on the ground that appears to have come from someone inside the base who was evacuated. Prior to the Crimean vote, many in the Russian navy and general staff felt that the prospects for the base were anything but positive, given that the Maidan very much opposed its continued presence on Ukrainian soil. But now that Crimea and Sevastopol have become “finally and irreversibly” part of Russia, the two say, everything has been turned upside down. Instead of being restricted by Ukrainian rules and facing further declines in the size and readiness of its naval and air forces in Sevastopol, Ishchenko and Vankov say, Moscow military planners can now plan for greater freedom of action, the expansion of the fleet, and what may be especially important the reopening of a shipyard for the construction of new vessels. Just how important this is for Russia was highlighted, the two continue, by the difficulties Defense Minister Sergey Shoygu faced in trying to reanimate Russia’s Mediterranean squadron, difficulties that will be largely overcome first by having Sevastopol as a domestic base and then by filling it with new or overhauled ships. Deputy Prime Minister Dmitry Rogozin denied Tuesday that Russia was contemplating sanctions against U.S. and European officials to retaliate for banking and travel restrictions imposed on officials involved in staging Sunday’s referendum in Crimea, in which voters overwhelmingly voted for joining Russia. The Foreign Ministry, however, said in a statement that Russia would retaliate in response to the sanctions, which targeted more than a dozen Russian and Ukrainian officials. Rogozin told journalists that the Russian government was not considering imposing sanctions against the U.S. and the European Union because it does not view the asset freezes and travel bans seriously. First of all, Rogozin’s statements should be seen as a bit of showboating, meant to be a sign that Russia is not afraid of the United States. If more sanctions are passed soon, there will almost certainly be a response from the Kremlin. Secondly, however, Rogozin may have a point. Thus far, Russia has barely been punished at all for its actions in Crimea. 1815 GMT: The statement from the Ministry of Defense says that, as a response to the photogrammetric center in Simferopol by forces wearing Russian uniforms and carrying automatic weapons and sniper rifles, Ukraine’s military forces are now authorized use weapons to defend themselves. Thus far, the hallmark of Ukrainian military forces in Crimea has been restraint. It seems, however, that this era of the conflict is now over and another one is beginning. Defence ministry of #Ukraine allows Ukrainian soldiers in #Crimea to use weapons. Situation escalates very quickly"
1747 GMT: Is this really the will of the Crimean people? Are the results of Sunday’s referendum valid? Or is this really a hostile takeover by a foreign body? Something to keep in mind. According to the official results of the referendum, nearly 97% of voters cast a ballot to join Russia, and there was more than 80% turnout. In other questions in the IRI poll, people were asked what their likelihood of voting would be. The number of people who say they would definitely vote hovers around 30%. The number who say they would definitely not vote is between 12% and 23%. This indicates that, if the referendum results are legitimate, virtually no one boycotted the referendum vote. So where do the 17% of the people who if given only one choice would join the EU fit in with that poll? Not only are the number of people who support joining Russia very small, but the number decreased between 2011 and 2013. More than 50% wanted to remain an autonomous part of Ukraine. And then there are the growing population of Tatars who also wanted to remain part of Ukraine. Combining those two numbers means that 65% of respondents wanted to stay part of Ukraine. Are we supposed to believe that these people did not boycott the referendum, but instead changed their minds and decided to join Russia? Of course, even by the end of Sunday there was ample evidence that there were a lot of problems with this vote, and it was nowhere near as one-sided as the official results indicate. 1719 GMT: Al Jazeera‘s Nick Schifrin reports on possible movements of Russian snipers near the Simferopol base. We saw what appeared to be Russian snipers leaving positions from building overlooking Ukrainian military base. 1712 GMT: The BBC’s Stephen Sackur reports that President Putin’s spokesman, Dmitry Peskov, has said that Russian military intervention in Eastern Ukraine is “out of the question”. Of course, the Kremlin has consistently denied that Russian forces invaded Crimea, so it’s not the most ironclad of assurances. Ukrainian military spokesman also confirms what we saw: russian military snipers were in action around base. 1638 GMT: We have posted a livestream from outside the military base that was reportedly stormed in Simferopol (see above). The video is quiet, but was first interrupted by what looked like an ambulance leaving, and then a sudden bang — but it was only fireworks. Ukrainian troops said they were being attacked by Russian forces and one soldier, Interfax news agency said quoting a Ukrainian military spokesman. “One Ukrainian serviceman has been wounded in the neck and collarbone. Now we have barricaded ourselves on the second floor. The headquarters has been taken and the commander has been taken. They want us to put down our arms but we do not intend to surrender,” he said. We now know that the soldier who was shot in the neck has died, according to Ukrainian officials. 1625 GMT: Belarus, a long-time Russian ally, was supposed to receive a shipment of 15 Russian Su-27SM3 aircraft. Now, that number has risen to 24. March 15, press service of the Belarusian defense ministry said Russia’s A-50 (NATO reporting name “Mainstay”) (a Soviet-built airborne early warning (AEW) aircraft based on the Ilyushin Il-76 transport) would go to the Baranovichi aerodrome (in Belarus’s Brest region) to participate in the second stage of checking the Belarus-Russia united regional air defense system. The Belarusian military said the technical features of A-50 “expand dramatically the opportunities for radar exploration, guidance for Belarusian and Russian fighters, as well as for managing the air defense forces on duty. This increase in direct military aid to Belarus, a neighbor to Ukraine, could be seen as a direct response to this crisis. “No amount of sham and perverse democratic process or skewed historical references can make up for the fact that this is an incursion into a sovereign state and a land grab of part of its territory with no respect for the law of that country or for international law,” he said. He said Vladimir Putin had chosen the path of “isolation” by signing a treaty which would make Crimea a part of Russia. 1613 GMT: Interfax and Reuters both report that according to the Ministry of Defense, a Ukrainian soldier has been killed today. Chrystyna Lapychak tells us that the BBC is reporting that the soldier who died was shot in the neck. All of this is unconfirmed, but considering the sourcing it’s very plausible. #Crimea Acting Ukr Pres Turchinov just finished video-conf with soldiers stuck on bases – telling them to…. keep waiting. More soldiers with shotguns and sniper rifles entering building near #ukraine military installation where truck in camo colors just entered. 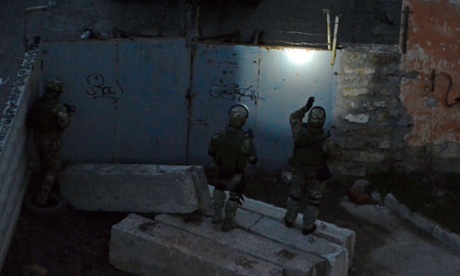 BREAKING- #Ukrainian officers confirm 200 armed pro-Russian militia have attacked a Ukrainian base. 1 man shot. 1550 GMT: As we’ve been writing for some time, Putin very likely anticipated a degree of economic fallout for his moves in Crimea. But from the looks of things, the damage may not be that great after all. Arrived at military cartography bldg outside Simferopol where shots fired. Police&goons guarding entrance, say nothing. Ambulance out front. Despite the initial euphoria promoted by the Kremlin’s propaganda effort, ever more Russians appear to be concerned that what Vladimir Putin has done in Crimea, however good it made them feel in the short term, may have bad consequences for themselves, their country, and even for those who have backed this annexation. On RBCDaily.ru, Vladislav Inozemtsev, the director of the Center for Research on Post-Industral Society, says that Russia “will pay dearly” for its Crimean action. Not only will it have to spend 4-5 billion US dollars a year on the peninsula, but it will face expanded capital flight, declining reserves, and increased inflation. In Crimea attempts are made to demonstratively capture Ukrainian military installations with both traumatic and fire arms. This was announced by the head of the Navy, Serhiy Hayduk in a Defence Ministry conference call. According to Hayduk, one of the officers in Simferopol received two wounds in his leg and was hospitalized. Abductions of officers are becoming more frequent, out of five officers, two were returned and three are being held by the so-called Crimean self-defence force. 1450 GMT: As part of Russia’s military modernization efforts, Russia struck a deal with France in 2011 that would deliver to the Russian navy four French Mistral-class amphibious assault crafts, state-of-the-art weaponry. As a sign of how serious the EU is taking these latest events, France is considering cancelling the $1.7 billion deal. “If Putin carries on like this, we could consider canceling these sales, ” Fabius said. He added that including the deal in sanctions would also hurt the French economy. Then again, one could flip this statement around. Russia has annexed Crimea, and is poised to invade Ukraine (though it’s not clear if that will happen), and yet France is only threatening to cancel the deal if things get worse. 1436 GMT: A lot of rumor chasing in Simferopol, the capital of Crimea. We have no confirmation on this story. What’s concerning about this is that there are a large host of Eastern European former Soviet Republics that are seeking to join the EU. Many of them have ethnic Russians, and financial interests in both Russia and Europe. If Russia’s motivation for the annexation of Crimea is to fight back on encroaching EU influence in former Soviet states, then it is possible that this crisis will repeat itself elsewhere. 1404 GMT: Yesterday, the world’s reaction to the Crimean referendum meant that the Russia stock market rallied. 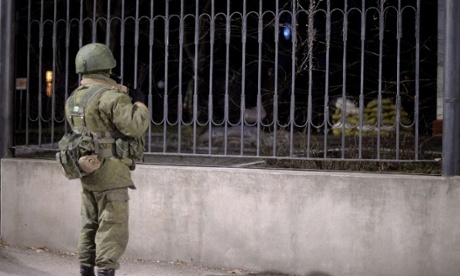 Will the reaction to Crimea’s annexation be any more swift or severe? Will the EU and US pass sanctions that finally impact the Russian economy? BREAKING: Obama invites G7 leaders for meeting in Europe next week to discuss further action on Ukraine. 1345 GMT: Russia has officially annexed Crimea. In a joint session of the Russian State Duma, Russian President Vladimir Putin gave a speech presenting the bill, and it was signed by both Russian and Crimean parliaments. But let’s look beyond the obvious news. The first little surprise is that Sevastopol, the home of Russia’s Black Sea fleet, was also annexed, but as a separate entity. Under Ukrainian rule, Sevastopol was one of two cities (the other being Kiev) that operated independently, but could this mean that under Russian rule the city has less autonomy than the rest of Crimea? Putin’s 50-minute speech was a catalog of 20 years of Russian complaints about the West. He touched on the downfall of the Soviet Union, Kosovo, NATO expansion, missile defense, Libya, Iraq and Syria. He mentioned Soviet support for the reunification of Germany in 1990. “I hope Germans will support the aspirations of Russians to restore Russia,” he said. “All these places are sacred to us,” he said. After noting that Soviet leader Nikita Khrushchev assigned Crimea to Ukraine in 1954, he argued that Russia by rights should have gotten it back in 1991 when the Soviet Union dissolved. “Russia was not just robbed — it was robbed in broad daylight,” he said. Putin also said that the city of Kiev was seized by “gunmen on the Maidan,” Russia has “no one to negotiate with,” and he reiterated Russia’s concerns about the fate of ethnic Russians within Ukraine. Putin sees Russia as the victim of the West. He sees it as his duty to restore Russia to its glory to fight against the forces and influence of the West. And he sees Crimea, and Ukraine, as a key part of this battle. And anyone who tells you otherwise is simply uninformed.